Slips and falls are one of the most common causes of non-fatal major injuries. All home, business and property owners are responsible for managing the risks of slipping and tripping to prevent injury and liability claims. Effective solutions are often simple, affordable and easy to implement. 1. Trip & Fall - caused due to encountering a foreign obstacle or object in the walking path. 2. Stump & Fall- caused when a moving foot comes across an impediment on the surface, which could be a tacky point or a defect that impedes the foot. 3. Step & Fall - caused when the foot finds an unexpected failure, void or hole in the walking surface. 4. Slip & Trip - caused when the contact between the sole of the shoe and the floor fails to lend support to the walker's center of gravity. 1. Look for slip and trip hazards around the home, including floor coverings and their condition, uneven floors, stairways and handrails, condition of walkways, trailing cables and areas that are sometimes slippery due to spillages. Don’t forget to include any outdoor areas, remembering that weather conditions may be a factor. 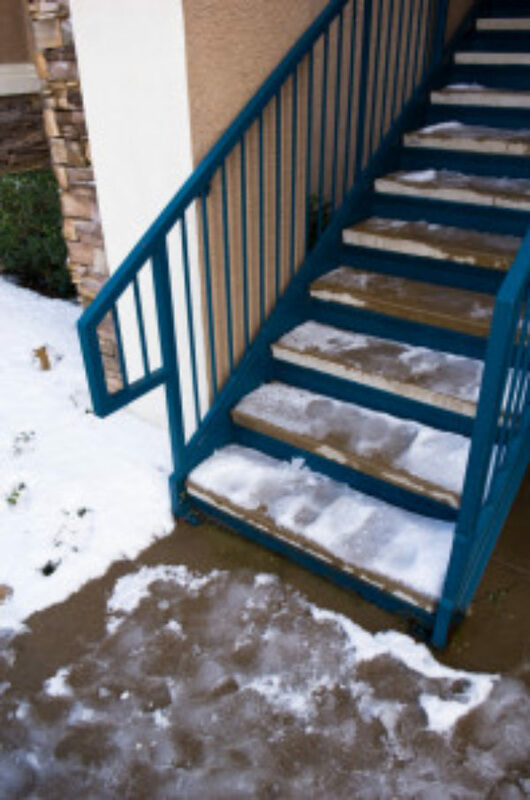 Snow covered, icy steps and walkways pose a serious slipping hazard. 2. Decide who might be harmed and how. Who comes into the premises? Are they at risk? Are some groups more at risk than others? 3. Consider the risks. Are there already measures in place to deal with the risks? Are floor coverings suitable for the area? Do stairways have handrails? Are walking surfaces straight and level? Do you conduct regular inspections? Are family members or guests instructed to keep traffic routes clear? 4. Regularly review your home and yard. If any significant changes take place, make sure that precautions are still adequate to deal with the risks. Ensure the height between stairs and landings is consistent. Even a slight difference in height can create a loss of balance and a potential fall or injury. Walkway surfaces should be smooth and level as raised or depressed areas increase the risk of trips and falls. To prevent accidents in stairway and walkway areas, improve visibility and lighting, install handrails and add tread markers or other floor markings. Prevent trip and fall accidents by having appropriate handrails & guardrails installed. the National Building Code of Canada requires a handrail be installed on interior and exterior stairs having more than three risers. Guardrails must be in place on all open sides of decks, patios and landings where the elevation exceeds 24”. Assess the cause of slipperiness and treat or clean accordingly. For example, treat chemically and use appropriate cleaning materials and methods. In some cases you may need to repair or replace the floor surface. Use de-icer, salt or sand during the winter months to prevent slipping in outdoor areas. Clean up all spills immediately and sweep debris from walking areas. If the floor is wet or oily, use appropriate signs to mark area and communicate that extra care is needed. Alternatively, use another route until the spillage or wetness is gone.